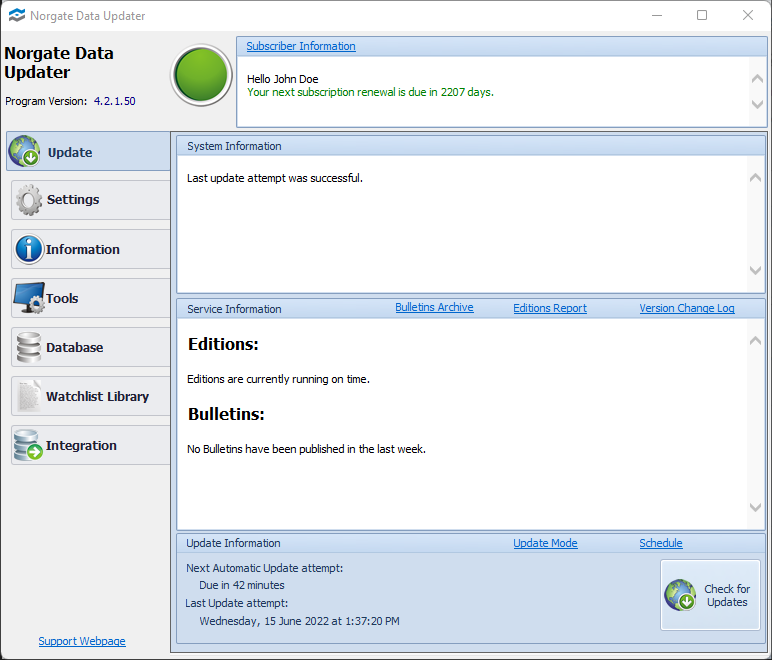 Norgate Data Updater ("NDU") is a Windows application that provides updates to a locally-installed database (historical data). In default mode, NDU runs "in the background" to deliver updates automatically as soon as new data becomes available. The data is held in a relational database. The format is proprietary and has been developed to balance speed, stability and extensibility. It incorporates various techniques such as write journaling and locking for robustness as well as localized data clustering for fast data retrieval. The data can only be accessed by way of plug-ins into popular charting/analysis applications. AmiBroker and RightEdge are supported initially, but additional plug-ins are planned. NDU allows the user to configure the data as s/he sees fit (and switch back-and-forth between different configurations). Date Padding options can be used to "fill-in" data on days where no trading occurred. Price Adjustment options can be used to selectively discount the effect of corporate actions such as stock splits, capital returns and ordinary cash dividends. Stock market data can be configured to show "price return" or "total return". NDU provides sophisticated means to search for particular securities or identify particular groups of securities. The results of a search can be saved as a Watch List for use in an external charting/analysis application. For more detailed information, see "Watch List Library". This important feature allows stock market back-testers to test on a consistent universe of stocks over time - e.g. the constituents of the S&P 500 index - and therefore avoid "survivorship bias". Note: a subscription level that provides access to delisted securities is required.